As any Ecommerce platform, improving Organic Search traffic is a must. People must be able to find your website through search engines like Google and Bing. Search Engine Optimization is a branch of Digital Marketing to improve your rankings on Search Engines. It’s a great way to gain traction on promoting your Ecommerce website to people through search engines. To do your SEO for WooCommerce, we will cover two SEO Plugins – All-in-One SEO Pack and the Yoast SEO. Doing SEO for WooCommerce websites involves knowledge in WordPress Development. Unlike when performing optimizations for Shopify, BigCommerce, or Magento, the strategy usually involves skills and knowledge specific on the platform. The SEO strategy for all eCommerce Websites relatively remains the same. Optimizations are user-centric and should always consider providing value for readers and visitors. SEO Agency and Specialists will often suggest optimizations that will involve action items. As for WooCommerce, creating an SEO-friendly website starts with the right tools for your website. Below are some of the tools you need and the optimizations that can be made with the tools. These can also be use to improve other digital marketing channels like your PPC campaigns, Social Media, and Content Marketing campaigns. This is one of the best SEO-related plugin you can use seamlessly with your WooCommerce Website and best of all its free. Aside from the usual SEO options like Meta Data Optimization, URL, Readability, Keyword Density, and more, what separates Yoast SEO from the others plugins is that it has specific optimizations for Social media websites like Pinterest and Twitter. This allows you to automate social media promotions. Here is a screenshot of the Twitter and Pinterest Card Option. In addition to Social Media optimizations, Yoast SEO allows you to implement Structured Data on your products. By doing this optimization, your search results will look better and will have higher Click-through-rate. Yoast SEO makes this implementation as simple as possible. You can choose from the many Structured Data available for Ecommerce Websites. 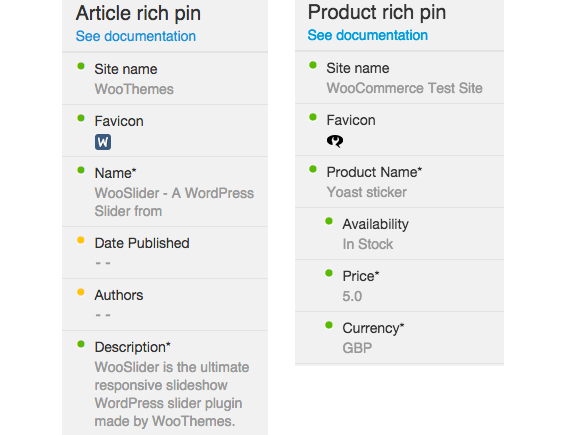 Creators of All-in-One SEO has a collection of tools dedicated to help you manage your WooCommerce website. Maximize the potential of your WooCommerce Website with these additional Plugins. SEO should be measurable and accountable thus to know if things are working. This can be done through analysis of relative data given by Google Analytics and other related sources. The analysis can be taxing and would require the expertise of an SEO professional. The end all of measuring SEO success is all about an increase in overall traffic and product revenue. To maximize these numbers, multiple efforts needs to be done to achieve your desired business growth. If you are looking for a business solution for your SEO needs, Ecommerce Tuning is an industry-leader for WooCommerce Search Engine Optization. We do not only provide the best SEO service but guarantee growth of your business. Give us a call today to know more about us. Try our free SEO audit! At EcomTuning.com we're a highly skilled team of experienced SEOs, conversion optimization experts and digital marketers. Our professionals combine their SEO experience with multiple years working for e-commerce businesses from around the world.